David Lentz, earth sciences professor and Economic Geology Chair at the University of New Brunswick, was recently awarded the Loring W. Bailey Award. The L.W. 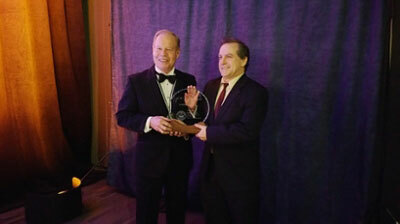 Bailey Award is the most prestigious award a professional geoscientist can receive from the Association of Professional Engineers and Geoscientists of New Brunswick (APEGNB). 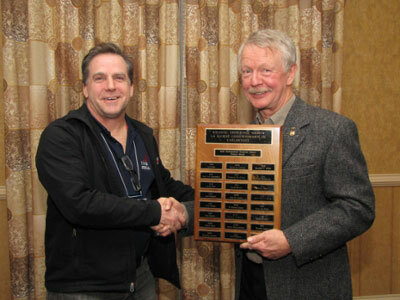 Presented at APEGNB’s annual general meeting that took place on Feb. 18 and 19, the L.W. Bailey award recognizes outstanding service and contribution to both the geoscience profession and the province of New Brunswick. First awarded in 2005, Dr. Lentz is the fifth recipient of the L.W. Bailey Award. On Feb. 6, Dr. Lentz was presented with the Distinguished Scientist Gesner Medal from the Atlantic Geoscience Society (AGS). The Gesner Medal is given to a person who has developed and promoted the advancement of geoscience in any field of geology with a contribution large enough to impact beyond the Atlantic region. Dr. Lentz’s research has had a tremendous impact on our understanding of Appalachian mineral deposit systems. The results of projects he has been involved with have been used extensively by the geological community to provide a better understanding of mineralizing systems in Atlantic Canada and throughout the world. His research on certain deposit systems in China, Argentina, Cameroon and parts of the Middle East remains very active. Dr. Lentz earned his bachelor of science degree with a major in geology in 1983 and MSc in 1986 both at UNB. In 1992, he completed his PhD at the University of Ottawa. He joined UNB’s faculty of geology (now called earth sciences) in 2000 as the Economic Geology Chair, where he has remained ever since. During his 16 years at UNB, he has authored or co-authored more than 100 publications. Dr. Lentz is a strong promoter of New Brunswick’s mineral potential and as such has attracted several exploration companies to the province, many of which have provided funds to support student research projects as well. He has secured funding from various companies, provincial and territorial governments, and the federal government, in particular the Geological Survey of Canada, but also the Canada Foundation for Innovation, New Brunswick Innovation Foundation and the Natural Sciences and Engineering Research Council.